The Australian coast known to Dutch explorers until 1644. Note the whole east coast is missing. Of an estimated 200 place names the Dutch bestowed on Australian localities in the 17th century as a result of the Dutch voyages of exploration along the western, northern and southern Australian coasts, only about 35 can still be found on current maps. Five out of six names were either renamed or forgotten or their locations were lost. Other places were named after the early Dutch explorers by later British explorers or colonists, for instance the Australian state of Tasmania is named after Abel Tasman. Australia itself was called New Holland by the English and Nieuw Holland by the Dutch. 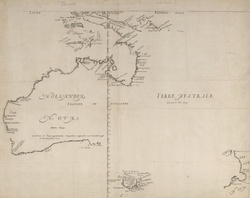 The Dutch charted the western side of Cape York Peninsula and the coast of the Gulf of Carpentaria. Willem Janszoon made the first recorded European landfall in Australia during the Janszoon voyage of 1605-6. Riv. met het Bosch Pennefather River 1606 For being a river in the bush 12°13′S 141°44′E﻿ / ﻿12.217°S 141.733°E﻿ / -12.217; 141.733﻿ (Cape York Peninsula) Australia's first recorded place name, intriguingly named after the emblematic "bush"
Kaap Arnhem Cape Arnhem and Arnhem Land 1623 The ship Arnhem which explored the area. 12°21′S 136°58′E﻿ / ﻿12.350°S 136.967°E﻿ / -12.350; 136.967﻿ (Arnhem Land) The ship was itself named after the city of Arnhem, Gelderland. Wesel Eilanden Wessel Islands 1636 The ship Klein Wesel or just Wezel, which explored the area. 11°30′S 136°25′E﻿ / ﻿11.500°S 136.417°E﻿ / -11.500; 136.417﻿ (Van Diemen Gulf) The ship was itself named after the city of Wesel, Duchy of Cleves. Limmen Bocht Limmen Bight 1644 The ship Limmen, one of the three ships in Tasman's 1644 expedition. 14°50′S 135°34′E﻿ / ﻿14.833°S 135.567°E﻿ / -14.833; 135.567﻿ (Limmen Bight) The ship was itself named after the town of Limmen, Holland. Willems Rivier Yardie Creek 1618 Willem Jansz, captain of the Duyfken 22°19′23″S 113°48′44″E﻿ / ﻿22.32306°S 113.81222°E﻿ / -22.32306; 113.81222 Named by captain Lenaert Jacobsz. Jansz was on board, making this his second visit to Australia. Landt van de Leeuwin Cape Leeuwin Leeuwin (galleon) 34°22′27″S 115°08′09″E﻿ / ﻿34.37417°S 115.13583°E﻿ / -34.37417; 115.13583 Name used for the land in the south west, now name only used for the cape. Landt van P. Nuyts Nullarbor Pieter Nuyts 32°18′S 125°52′E﻿ / ﻿32.300°S 125.867°E﻿ / -32.300; 125.867 Nuytsland comprised the entire coast adjoining the Great Australian Bight. The name survives in two smaller, separate areas: Nuytsland Nature Reserve and Nuyts Land District. Landt van P. Nuyts Nullarbor 1/16/1627 Pieter Nuyts 32°S 132°E﻿ / ﻿32°S 132°E﻿ / -32; 132 Nuytsland was the given to the coast adjoining the Great Australian Bight. Van der Lijns Eijland Vanderlins Island 1642 Cornelis van der Lijn, member of the Council of India 42°13′S 148°18′E﻿ / ﻿42.217°S 148.300°E﻿ / -42.217; 148.300﻿ (Freycinet Peninsula) not an island, actually Freycinet Peninsula. When Tasman passed it he was heading east; did not see the connection to the mainland in the north. Duyfken Point - 12°34′S 141°35′E﻿ / ﻿12.567°S 141.583°E﻿ / -12.567; 141.583 near Weipa where Willem Janszoon first sighted the Australian coast in 1606. Zeehan, Tasmania - 41°53′S 145°20′E﻿ / ﻿41.883°S 145.333°E﻿ / -41.883; 145.333 town and nearby Mount Zeehan, named by George Bass and Matthew Flinders after Abel Tasman's ship Zeehaen. It is near where Tasman first sighted Tasmania. Project Gutenberg, The Discovery of Tasmania (Van Diemen's Land. ), New Zealand, and Bass' Straits. This page was last edited on 12 June 2018, at 03:05 (UTC).